Liczba stron: 339 Jest to ujednolicona liczba stron, która ułatwi Ci porównanie długości książek. Każda strona Legimi to 200 słów. Agnes Grey is the daughter of a minister who faces financial ruin. Agnes decides to take up one of the only professions available to Victorian gentlewomen and become a governess. 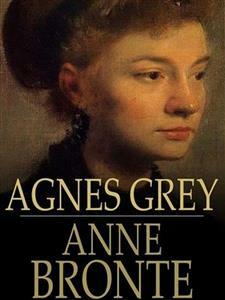 Drawing on her own, similar experiences, Anne Bronte portrays the desperation of such a position. Agnes' livelihood depends on the whim of spoiled children, and she witnesses how wealth and status can degrade social values. Influenced by so many inducements, I determined still to persevere; though the fear of displeasing my mother, or distressing my father's feelings, prevented me from resuming the subject for several days. At length, again, I mentioned it to my mother in private; and, with some difficulty, got her to promise to assist me with her endeavours. My father's reluctant consent was next obtained, and then, though Mary still sighed her disapproval, my dear, kind mother began to look out for a situation for me. She wrote to my father's relations, and consulted the newspaper advertisements--her own relations she had long dropped all communication with: a formal interchange of occasional letters was all she had ever had since her marriage, and she would not at any time have applied to them in a case of this nature. But so long and so entire had been my parents' seclusion from the world, that many weeks elapsed before a suitable situation could be procured. At last, to my great joy, it was decreed that I should take charge of the young family of a certain Mrs. Bloomfield; whom my kind, prim aunt Grey had known in her youth, and asserted to be a very nice woman. Her husband was a retired tradesman, who had realized a very comfortable fortune; but could not be prevailed upon to give a greater salary than twenty-five pounds to the instructress of his children. I, however, was glad to accept this, rather than refuse the situation--which my parents were inclined to think the better plan. But some weeks more were yet to be devoted to preparation. How long, how tedious those weeks appeared to me! Yet they were happy ones in the main--full of bright hopes and ardent expectations. With what peculiar pleasure I assisted at the making of my new clothes, and, subsequently, the packing of my trunks! But there was a feeling of bitterness mingling with the latter occupation too; and when it was done--when all was ready for my departure on the morrow, and the last night at home approached--a sudden anguish seemed to swell my heart. My dear friends looked so sad, and spoke so very kindly, that I could scarcely keep my eyes from overflowing: but I still affected to be gay. I had taken my last ramble with Mary on the moors, my last walk in the garden, and round the house; I had fed, with her, our pet pigeons for the last time--the pretty creatures that we had tamed to peck their food from our hands: I had given a farewell stroke to all their silky backs as they crowded in my lap. I had tenderly kissed my own peculiar favourites, the pair of snow-white fantails; I had played my last tune on the old familiar piano, and sung my last song to papa: not the last, I hoped, but the last for what appeared to me a very long time. And, perhaps, when I did these things again it would be with different feelings: circumstances might be changed, and this house might never be my settled home again. My dear little friend, the kitten, would certainly be changed: she was already growing a fine cat; and when I returned, even for a hasty visit at Christmas, would, most likely, have forgotten both her playmate and her merry pranks. I had romped with her for the last time; and when I stroked her soft bright fur, while she lay purring herself to sleep in my lap, it was with a feeling of sadness I could not easily disguise. Then at bed-time, when I retired with Mary to our quiet little chamber, where already my drawers were cleared out and my share of the bookcase was empty--and where, hereafter, she would have to sleep alone, in dreary solitude, as she expressed it--my heart sank more than ever: I felt as if I had been selfish and wrong to persist in leaving her; and when I knelt once more beside our little bed, I prayed for a blessing on her and on my parents more fervently than ever I had done before. To conceal my emotion, I buried my face in my hands, and they were presently bathed in tears. I perceived, on rising, that she had been crying too: but neither of us spoke; and in silence we betook ourselves to our repose, creeping more closely together from the consciousness that we were to part so soon. But the morning brought a renewal of hope and spirits. I was to depart early; that the conveyance which took me (a gig, hired from Mr. Smith, the draper, grocer, and tea-dealer of the village) might return the same day. I rose, washed, dressed, swallowed a hasty breakfast, received the fond embraces of my father, mother, and sister, kissed the cat--to the great scandal of Sally, the maid-- shook hands with her, mounted the gig, drew my veil over my face, and then, but not till then, burst into a flood of tears. The gig rolled on; I looked back; my dear mother and sister were still standing at the door, looking after me, and waving their adieux. I returned their salute, and prayed God to bless them from my heart: we descended the hill, and I could see them no more. 'Yes, I hope so,' replied I, as calmly as I could. Here ended our colloquy. We crossed the valley, and began to ascend the opposite hill. As we were toiling up, I looked back again; there was the village spire, and the old grey parsonage beyond it, basking in a slanting beam of sunshine--it was but a sickly ray, but the village and surrounding hills were all in sombre shade, and I hailed the wandering beam as a propitious omen to my home. With clasped hands I fervently implored a blessing on its inhabitants, and hastily turned away; for I saw the sunshine was departing; and I carefully avoided another glance, lest I should see it in gloomy shadow, like the rest of the landscape. As we drove along, my spirits revived again, and I turned, with pleasure, to the contemplation of the new life upon which I was entering. But though it was not far past the middle of September, the heavy clouds and strong north-easterly wind combined to render the day extremely cold and dreary; and the journey seemed a very long one, for, as Smith observed, the roads were 'very heavy'; and certainly, his horse was very heavy too: it crawled up the hills, and crept down them, and only condescended to shake its sides in a trot where the road was at a dead level or a very gentle slope, which was rarely the case in those rugged regions; so that it was nearly one o'clock before we reached the place of our destination. Yet, after all, when we entered the lofty iron gateway, when we drove softly up the smooth, well-rolled carriage-road, with the green lawn on each side, studded with young trees, and approached the new but stately mansion of Wellwood, rising above its mushroom poplar-groves, my heart failed me, and I wished it were a mile or two farther off. For the first time in my life I must stand alone: there was no retreating now. I must enter that house, and introduce myself among its strange inhabitants. But how was it to be done? True, I was near nineteen; but, thanks to my retired life and the protecting care of my mother and sister, I well knew that many a girl of fifteen, or under, was gifted with a more womanly address, and greater ease and self-possession, than I was. Yet, if Mrs. Bloomfield were a kind, motherly woman, I might do very well, after all; and the children, of course, I should soon be at ease with them--and Mr. Bloomfield, I hoped, I should have but little to do with. 'Be calm, be calm, whatever happens,' I said within myself; and truly I kept this resolution so well, and was so fully occupied in steadying my nerves and stifling the rebellious flutter of my heart, that when I was admitted into the hall and ushered into the presence of Mrs. Bloomfield, I almost forgot to answer her polite salutation; and it afterwards struck me, that the little I did say was spoken in the tone of one half-dead or half-asleep. The lady, too, was somewhat chilly in her manner, as I discovered when I had time to reflect. She was a tall, spare, stately woman, with thick black hair, cold grey eyes, and extremely sallow complexion. 'I daresay you would find it cold,' replied she with a cool, immutable gravity that did not serve to reassure me. I replied I was quite willing to do so; and at that moment my young pupils entered the apartment, with their two younger sisters. Master Tom Bloomfield was a well-grown boy of seven, with a somewhat wiry frame, flaxen hair, blue eyes, small turned-up nose, and fair complexion. Mary Ann was a tall girl too, somewhat dark like her mother, but with a round full face and a high colour in her cheeks. The second sister was Fanny, a very pretty little girl; Mrs. Bloomfield assured me she was a remarkably gentle child, and required encouragement: she had not learned anything yet; but in a few days, she would be four years old, and then she might take her first lesson in the alphabet, and be promoted to the schoolroom. The remaining one was Harriet, a little broad, fat, merry, playful thing of scarcely two, that I coveted more than all the rest--but with her I had nothing to do. I talked to my little pupils as well as I could, and tried to render myself agreeable; but with little success I fear, for their mother's presence kept me under an unpleasant restraint. They, however, were remarkably free from shyness. They seemed bold, lively children, and I hoped I should soon be on friendly terms with them--the little boy especially, of whom I had heard such a favourable character from his mamma. In Mary Ann there was a certain affected simper, and a craving for notice, that I was sorry to observe. But her brother claimed all my attention to himself; he stood bolt upright between me and the fire, with his hands behind his back, talking away like an orator, occasionally interrupting his discourse with a sharp reproof to his sisters when they made too much noise. When the room and books had been shown, with some bickerings between the brother and sister that I did my utmost to appease or mitigate, Mary Ann brought me her doll, and began to be very loquacious on the subject of its fine clothes, its bed, its chest of drawers, and other appurtenances; but Tom told her to hold her clamour, that Miss Grey might see his rocking-horse, which, with a most important bustle, he dragged forth from its corner into the middle of the room, loudly calling on me to attend to it. Then, ordering his sister to hold the reins, he mounted, and made me stand for ten minutes, watching how manfully he used his whip and spurs. Meantime, however, I admired Mary Ann's pretty doll, and all its possessions; and then told Master Tom he was a capital rider, but I hoped he would not use his whip and spurs so much when he rode a real pony. 'And MINE,' said Mary Ann. 'No matter--you MUST come; I shall allow of no excuses,' replied the consequential little gentleman. And, as it was the first day of our acquaintance, I thought I might as well indulge him. It was too cold for Mary Ann to venture, so she stayed with her mamma, to the great relief of her brother, who liked to have me all to himself. He next took me across the lawn to see his mole-traps, and then into the stack-yard to see his weasel-traps: one of which, to his great joy, contained a dead weasel; and then into the stable to see, not the fine carriage-horses, but a little rough colt, which he informed me had been bred on purpose for him, and he was to ride it as soon as it was properly trained. I tried to amuse the little fellow, and listened to all his chatter as complacently as I could; for I thought if he had any affections at all, I would endeavour to win them; and then, in time, I might be able to show him the error of his ways: but I looked in vain for that generous, noble spirit his mother talked of; though I could see he was not without a certain degree of quickness and penetration, when he chose to exert it.